Who's Stacey Abrams, Giving Democratic Response To State Of The Union? While Abrams lost the Georgia governor's race last fall, her activism around voting rights and strong performance at the polls made her an attractive choice for Democratic congressional leaders. Stacey Abrams addresses supporters at an election watch party on Nov. 6, 2018. Although Abrams lost her bid to be Georgia's governor, Democrats have tapped her to deliver the response to President Trump's State of the Union address. To give the customary response to the presidential State of the Union address Tuesday night, Democratic congressional leaders selected a not-so-customary person. Normally, the opposition party chooses someone well-known for their time in Congress or statewide office. But this year, Democrats turned to Stacey Abrams, who lost the governor's race in Georgia last fall. Still, "it makes a great deal of sense," said Rep. John Lewis, D-Ga., of the choice. 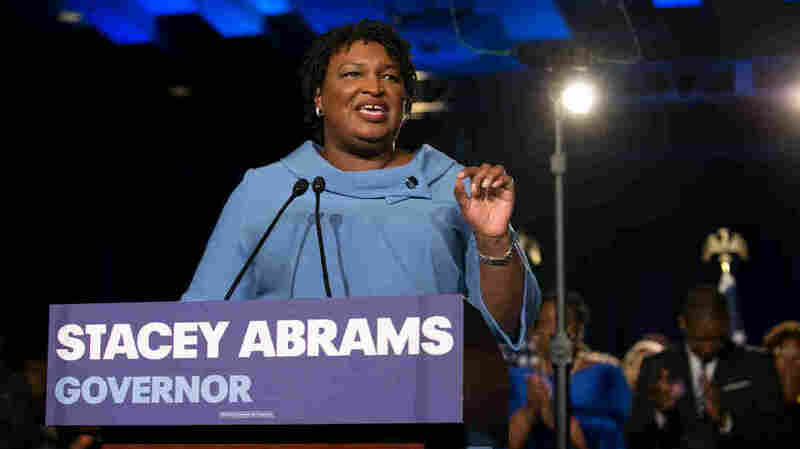 Abrams, the former minority leader of the Georgia General Assembly, is "a fresh face, a fresh voice," Lewis said, with "a history of fighting for voting rights." She refused to formally concede to her Republican opponent Brian Kemp after the election, in part because Kemp oversaw their election as Georgia's secretary of state and refused to recuse himself. Abrams accused him of widespread voter suppression, which he denies. Kemp and other Republican critics have branded her a radical, but politics aside, her campaign broke new ground. Kemp won by 55,000 votes, the narrowest race in years in what has been a heavily Republican state. Now, Georgia is seen as a potential battleground in 2020. And voting rights, which were a central theme of Abrams' campaign, are a national issue for Democrats. Early in the session, House Democrats introduced a major voting rights and government ethics bill known as HR 1. Abrams acknowledged the national conversation in an interview with WABE last month: "We need to talk about voter suppression. We need to talk about access to voting rights," she said. "And I think HR 1, whether it becomes law, sets the table for what should be the discussion for the next few years in the United States." Abrams has been working to register voters for years, including her work to found the nonpartisan New Georgia Project. Then-Secretary of State Kemp's office investigated that group on allegations of fraud in 2014, but the investigation was later dropped. For her 2018 gubernatorial race, Abrams built on that work, and her campaign claims it created an unprecedented get-out-the-vote infrastructure. "Part of what Stacey's candidacy allowed was for her to see a different Georgia," said Allegra Lawrence-Hardy, Abrams' campaign chairwoman. "The future was coming and she saw it before a lot of us did and to really build that infrastructure," she said. "And it's that momentum that we're harnessing that really is applicable nationwide." After the election, Abrams created Fair Fight Georgia, dedicated to expanding voting rights in Georgia. The group has filed federal litigation against the state and its voting system. It also aired a Super Bowl ad last weekend. Win or lose, the Abrams campaign is a model for Democrats going forward, said Andra Gillespie, a political science professor at Emory University. "The fact that she came as close as she did suggests that her strategy has some merit to it," Gillespie said. "And if it didn't succeed this time, that perhaps it would succeed for Democrats in the future." But still, Abrams is a unique choice. She's the first black woman to give the response, which Lewis said is no accident. "It was the black women who tend to turn out higher, and I think it will play a role here in Georgia, throughout the South and throughout America," he said. "There's no other demographic that votes consistently in high numbers more than African-American women," agreed Tharon Johnson, a longtime Democratic strategist in Georgia. He said putting more representative leadership forward is key for Democrats. "I think that Sen. Schumer and Speaker Pelosi have read all the polling and all the memos that I've read," he said. "And that is that if we're going to win back the White House in 2020, we've got to do some things differently." By appealing to a broader slice of the electorate, Abrams was able to do something different in Georgia: outperform past Democratic candidates who were white. "What Abrams' candidacy proved was that race isn't a liability," Gillespie said. "So she basically dispelled any sort of fear that a strong black candidate can't be competitive as a statewide nominee for office." Tonight's response comes as Abrams faces a big decision about her own political future. Will she challenge Republican Sen. David Perdue in 2020? Or wait for a rematch with Gov. Kemp? She has given herself until the end of March to decide.